A few pointers on how you can easily provide all the info we need to get you the perfect website. It’s a rough guide only, feel free to improvise to suit your needs best! If you already have a website that needs updating, we just need a link and any changes you need together with ideas you have for improvements - include links to other sites (maybe competitors or similar sites you like). Otherwise, when starting from scratch, use the guide below and the example provided. Tell us about your organisation, products & target market. A lot will naturally already be in your website content so we’ll get the gist usually anyway. Let us know the aim of the new website too, as that might affect the design - as well as any other nice websites that you’ve seen which you think would work well - or competitor sites (good & bad)! Pictures are really important on websites today - often forming moving backgrounds & full page images with headlines on them. Send as many good photos as you have - especially things like the outside of your shop, your products & team. We can use stock photos where necessary too, but real pictures can really personalise your site. 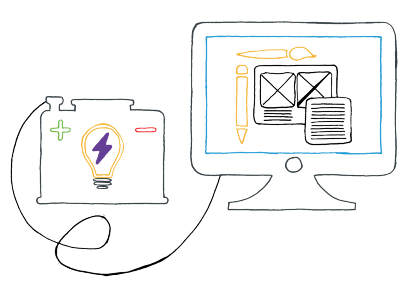 Separate your Pages into sections, think about icons, pictures and the text that go into it. Include a list of key features/bullet points/USP’s of your service/product if you can. In the Overview or Brief, tell us about your product, service and target market (typical user/customer) so we can tailor the design, style and content to them for you. Think about Mobile visitors - mobile viewers account for well over 50% of visitors and lots of text isn’t very user-friendly on smaller devices - especially on your home page, keep it brief and to the point, but in total you’ll need at least 300 words on each page so search engines can get a feeling for what each page is about. 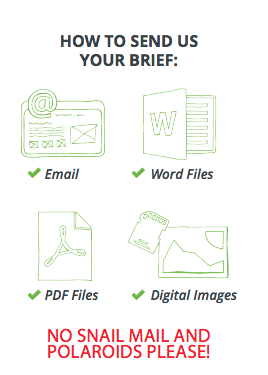 The best way to send across your breif would be via email, using standard digital documents, such as Word files for ext, PDF and digital images so that we can add them straight into your site. Any other method will delay your Jumpstart being completed. 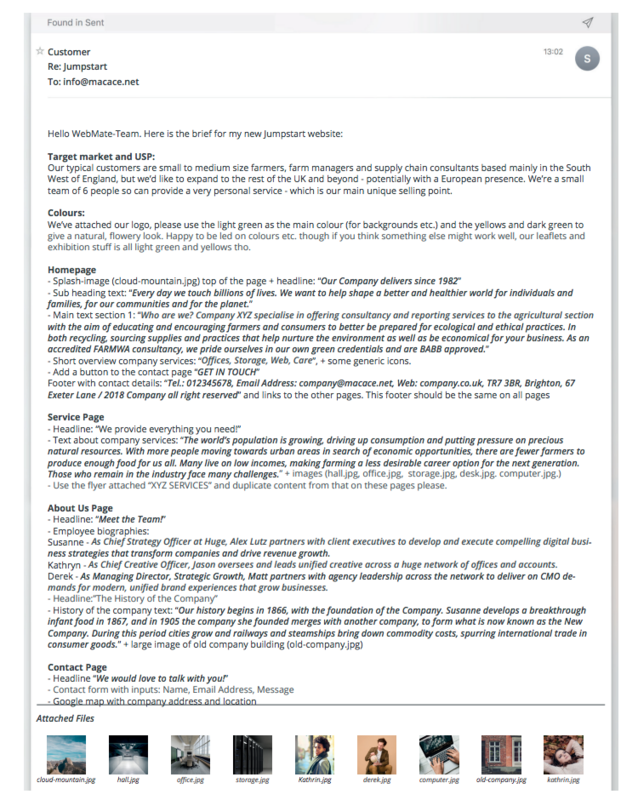 If you are unsure of what a good Jumpstart email to us looks like, we have provided an example further down. The information provided is also available in PDF format for easy printing - CLICK HERE to download. If you have any questions at all, please raise a Support ticket and we will be able to answer any questions you still have.